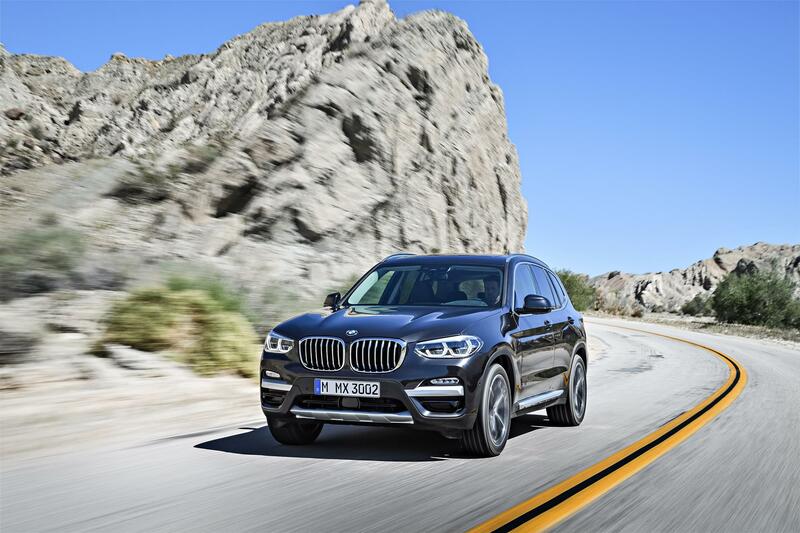 BMW has redesigned the X3 crossover, but side-by-side with its predecessor, there isn’t much that jumps out as “new.” Instead, BMW worked on subtle changes that enhance the goodness of the X3 without changing the overall appeal of the crossover. It’s a smart approach for the 2018 X3 as there really wasn’t much about it that needed change. 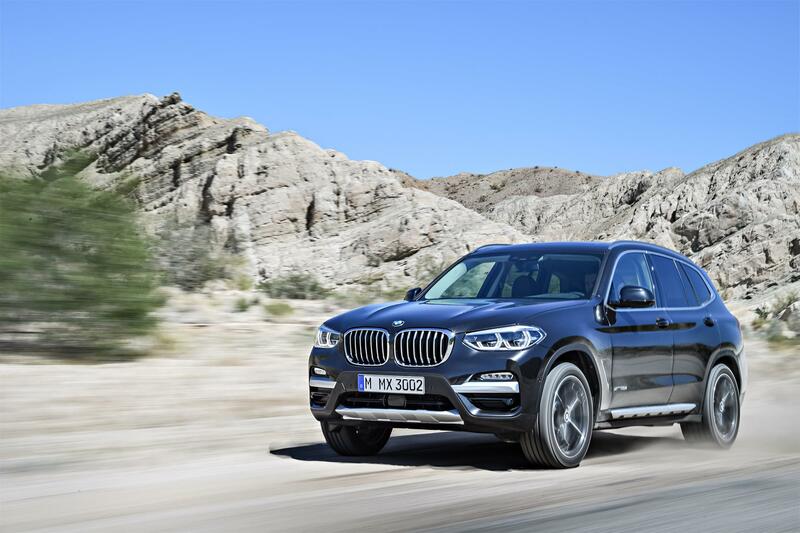 The major changes to the 2018 BMW X3 were obviously carefully chosen. Externally, most of the changes are subtle tweaks rather than a design overall. Inside, there is a lot more room than there was before and the infotainment becomes a touchscreen display to make it more intuitive. 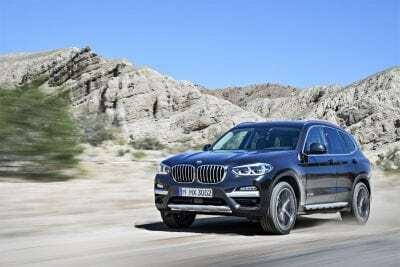 All-wheel drive is now standard on the X3 as well, another boon. What’s stayed the same is the BMW focus on the driver, the good looks of the X3, and the excellent narrowing of trim options BMW is well known for. The X3 is a useful crossover that doesn’t lose out on the fun available to a compact AWD vehicle. There are two basic trim points for the 2018 X3, each of which denotes a different powertrain. These trims have some add-on packages available as well. 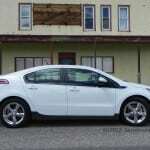 Convenience package with keyless entry, panoramic sunroof, satellite radio. M Sport package which adds the Convenience package plus 19-inch wheels, more aggressive bumpers, a sport steering wheel, and simulated leather dashboard. 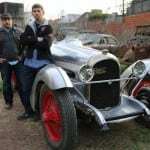 Dynamic Handling package can be added to either of the other packages to add adaptive suspension dampers, upgraded brakes, and variable-ratio steering tied to the drive mode controls. Driving Assistance package which adds forward collision warning, automatic emergency braking, lane departure warning, and blind-spot monitoring with rear cross-traffic alert. Driving Assistance Plus adds the Driving Assistance items plus adaptive cruise control, front cross-traffic alert, and lane departure mitigation. Parking Assistance package can be added to DA+ package and adds automated parking system and 360-degree on-board cameras. The above items can be bundled in groups in the Premium or Executive all-inclusive packages. 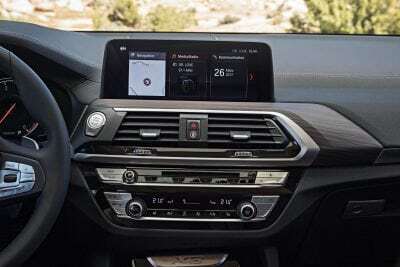 The Premium package adds a head-up display, 10.3-inch infotainment screen, and BMW Remote Services. The Executive adds those things plus adaptive LED headlamps, leather upholstery, a digital instrument panel, and hands-free gesture controls. 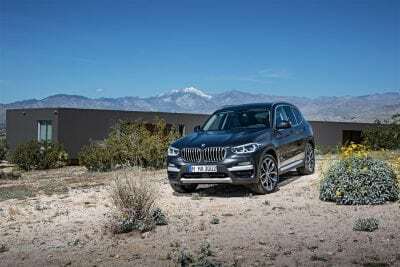 It’s not noticeable unless the 2018 BMW X3 is parked next to the outgoing model of the crossover, but the little X3 has grown in almost every dimension. The X3 is wider and longer, though not higher. The front fascia has been updated with some small changes that make an impact on the X3’s look, accentuating the wider stance for a sportier, more aggressive look. These exterior changes are quiet, though, and not obvious to those unfamiliar with the X3. On the inside, the changes to the new X3 are immediately apparent. The rear seat gets more knee and shoulder room thanks to the crossover’s growth for this new generation. Front seat occupants will immediately notice the infotainment changes, which are now more usable. The driver will enjoy the better view of instrumentation and controls. Downsides are the head-up display’s disappearing act when polarized lenses are worn and there is no digital speedometer readout unless Sport driving mode is active. 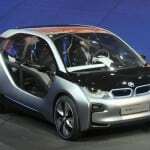 Gesture control support, a big thing in other BMW rides, is only available in the most expensive X3. The 2018 BMW X3 is well-done overall, though, with a great interior built from quality materials. 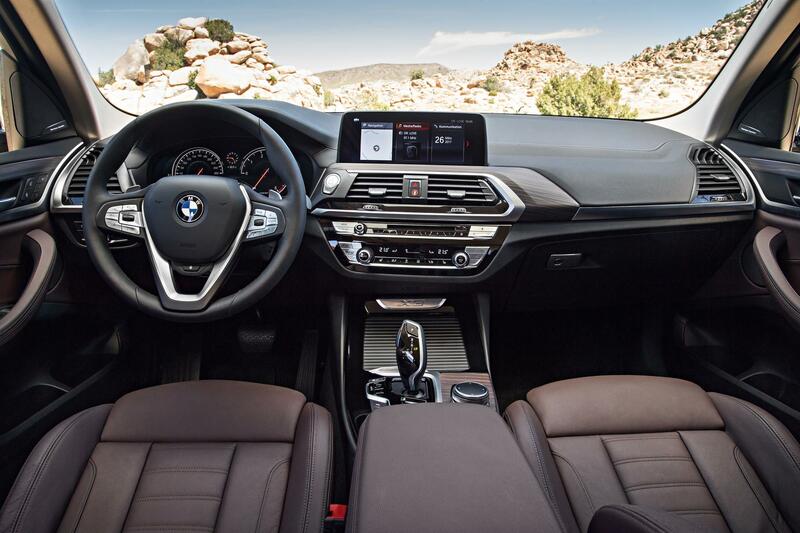 We like the layout, which is typically simple and effective in that Teutonic BMW way. 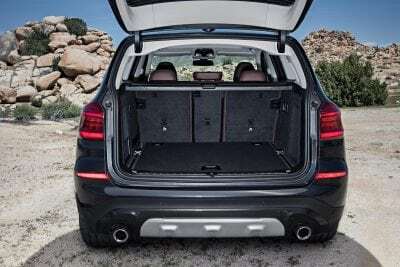 Cargo is also good at 28.7 cubic feet behind the rear seats. 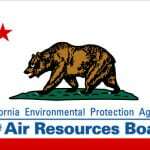 Those fold down (split-fold as standard) to allow 62.7 cubic feet. Also unusual and of note is the option to change the compact spare tire for a standard-sized tire and wheel. Unusual in today’s market and very unusual for BMW, who seems to love (expensive) run-flats instead. 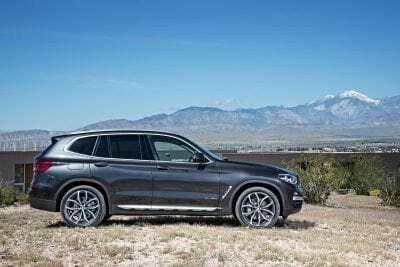 The 2018 BMW X3 feels good on the road, especially when compared to other compact crossovers. It’s a great driving vehicle with a sporty, confident feel about it. The base model comes with a 2.0-liter turbocharged four-cylinder that outputs 248 horsepower to an eight-speed automatic transmission. All-wheel drive is standard. This drivetrain is a good one, with plenty of umph for the car and lots of smart shifting programming for the transmission. It feels about right and isn’t too aggressive or too weak most of the time. Our chief complaint is with the turbo lag present, which is common in many BMW models. 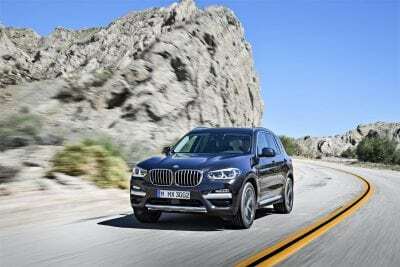 The M40i model, however, boosts things with a 3.0-liter twin-turbo V6 that outputs 355 horses through the same transmission (reprogrammed) and drivetrain. 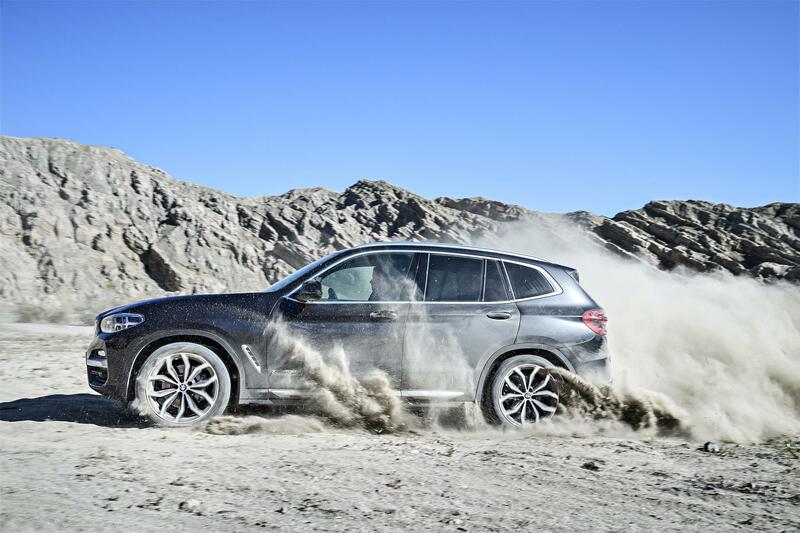 This is a fast-paced, fun-driving machine and the lag is far less noticeable in the bigger six. 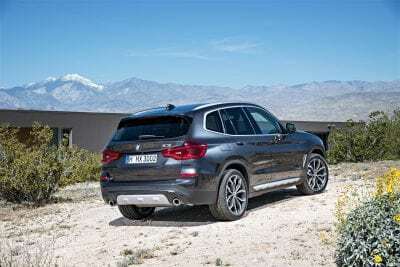 With either powertrain, the 2018 X3 is confident on the road and has plenty of manners when driven normally, but sheds some of those when pressing the throttle and going into a corner. All good things. We like the Dynamic Handling package for the base model and think that will help many who aren’t interested in the lower fuel economy of the six get more fun out of their four-banger version. Fuel economy in the X3 is pretty good for the segment. The four-cylinder model is rated at 22 mpg in the city and 29 mpg on the highway with our real-world drive getting a 25 mpg average overall. That’s not too shabby for an AWD offering in the compact crossover segment. The M40i is EPA-rated at 20 mpg city and 27 mpg highway. We suspect it will be close to that in the real world too. The most competitive options in the compact luxury crossover segment right now are the Audi Q5, the Mercedes-Benz GLC-Class, and the Cadillac XT5. Of these, the Audi is the closest in terms of packaging and price to the X3 while the Mercedes offers a classier look and equal road presence. The Cadillac is very American with its luxury, but has a compelling offer. Measured against these, the X3 stands out for its daily usefulness and good overall build. Ergonomics are improved in this new design. Great drive quality that doesn’t sacrifice fuel economy in the standard model. Sport M40i is strong for its true-to-promise focus. Recalls galore for this new generation, which is somewhat part-and-parcel for a new offering. Apple-based tech in the cabin leaves out the majority of users who are Android-based. Hard to measure value in a luxury vehicle in this segment. 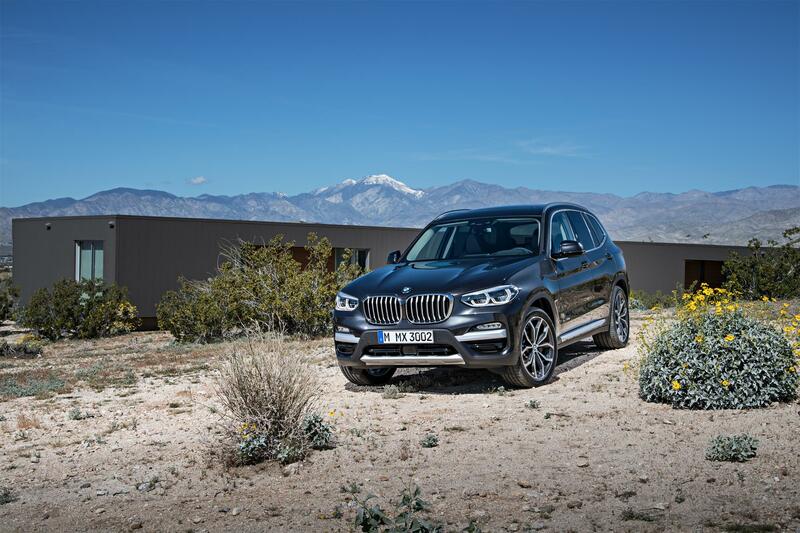 We really like the 2018 BMW X3 as it is. There are a few things that could change, but nothing so in-your-face that we’d demand it. It’s right-sized, well-made, and combines a good driving experience with daily usefulness very well. The X3 was a manufacturer’s press loan for about a week, during which time about 200 miles were put on the vehicle. Various passenger loads were included in the driving and both highway and city driving were tested.